The NFL Draft just got more interesting at college football's expense. Possibly the best player in the draft has left his school, both removing all doubt as to whether he would leave for the NFL after the season and putting a serious question mark on the team's national championship aspirations. While that has been going on, things are getting clearer in the MLB postseason while USA Gymnastics again had a negative spotlight cast upon it. College football players must be in college for three years of football before they can play in the NFL. Period. There is no way around this. 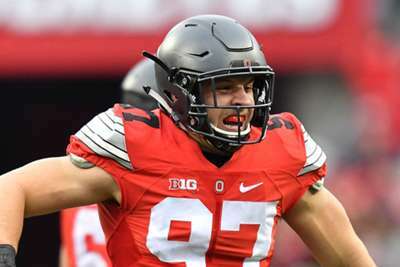 But Nick Bosa, who is seen by many pundits as the top overall prospect in the 2019 draft, will not play three full years. Bosa, who plays for the Ohio State Buckeyes, has decided to leave school in the middle of his third season to focus on the upcoming draft. The reason being is the defensive end suffered a core injury requiring surgery in the third game of the season and has yet to get back on the field. He will now concentrate on rehabbing the injury instead of finishing his third year. This is a surprising situation because the Buckeyes are currently in line to make it to the College Football Playoff and Bosa is their best player. But Bosa's future is on the line here, so it is hard to blame him. Good thing a player does not actually have to be active for three full college seasons, he just has to be three years removed from high school. MLB is one game away in each league from setting the participants for the World Series. The Los Angeles Dodgers took a 3-2 series lead over the Milwaukee Brewers in game five on Thursday while the Boston Red Sox took a 3-1 lead over the Houston Astros in a dramatic game four. That game was back and forth and came down to two plays of inches where Mookie Betts was awarded a robbed home run on a fan interference play in the first inning, and Andrew Benintendi stole what was likely a two-run single from Alex Bregman with two outs and the bases loaded in the ninth. If the Dodgers were to make it to the World Series, it would be the first time since 1965-66 Los Angeles have made it to back-to-back fall classics. The Red Sox have not been since 2013 when they defeated the St Louis Cardinals in six games. The NBA season is officially underway as almost every team has seen action in the first two days of the campaign. Defending champions the Golden State Warriors opened up with a win over the Russell Westbrook-less Oklahoma City Thunder, but it was their championship rings which truly caused a stir. Golden State's rings are actually reversible and feature 74 diamonds to commemorate the team's 74 victories between the regular season and playoffs. The Warriors are once again favoured to win the NBA title this season. USA Gymnastics has had a rough few years with the revelations of the Larry Nassar case in which he was convicted of sexually abusing numerous women and girls in his time with the organisation, but things got even worse. In the first incident, USAG's CEO Mary Bono resigned after a personal tweet surfaced in which she covered up the Nike logo on her golf shoes because the company decided to use Colin Kaepernick as the face of its add campaign. That was tough, but what was even more surprising was a day later when former USA Gymnastics president Steve Penny was arrested for allegedly tampering with evidence relating the Nassar case. USA Gymnastics has had a rough go of it and things are not getting any easier. The organisation has now had three CEOs forced to resign in the last 19 months. Penny was the first to be arrested. The United States women took down Canada in the CONCACAF Championship final to lock up the title after the team had already earned a spot in the 2019 FIFA Women's World Cup with their performances earlier in the tournament. Midfielder Rose Lavelle put USA ahead in the second minute. She received the ball just outside the box and sent a left-footed shot past Canada goalkeeper Stephanie Labbe and into the corner of the net. Despite the loss, Canada also locked up a berth at the World Cup.